Rich in Omega-3 Fatty Acids. Purslane is one of the richest green plant sources of Omega-3 fats. It can lower triglyceride and cholesterol levels while increasing the healthy high density lipoprotein. In addition, the ability of Omega-3 fatty acids to reduce the blood viscosity proves beneficial in treating different vascular diseases. Unlike fish oils that contain cholesterol, purslane is an excellent source of Omega-3 fatty acids without any cholesterol present. Research shows that a diet high in Omega-3 fatty acids can reduce insulin resistance in diabetics. A handful of purslane daily can help maintain your blood sugar in check. Consuming foods rich in Omega-3s has been shown to significantly reduce the risk of atherosclerosis and heart disease. Further, its high potassium content can help reduce blood pressure as it works as a vasodilator – relaxing the blood vessels while reducing the strain of the heart muscles. Works as an Antioxidant. Purslane leaves have been found to possess higher amount of beta-carotene, ascorbic acid and alpha-tocopherol. Vitamin C (Ascorbic acid) and beta-carotene (Vitamin A) are known to have antioxidant qualities due to their ability to neutralize free radicals and even present certain cancers and cardiovascular disease. Vitamin A is a powerful antioxidant and a crucial vitamin for eye health, reducing the risk of developing macular degeneration and cataracts. It is also necessary to keep healthy skin and mucosa. Alpha-tocopherol (Vitamin E) is a fat-soluble antioxidant that can inhibit the production of free radicals. Furthermore, there are two kinds of betalain alkaloid pigments, the yellow β –xanthins and reddish β –cyanins. These two pigments are powerful antioxidants that have been shown to have antimutagenic properties, keeping cancer development at bay. Aid in Weight Loss. 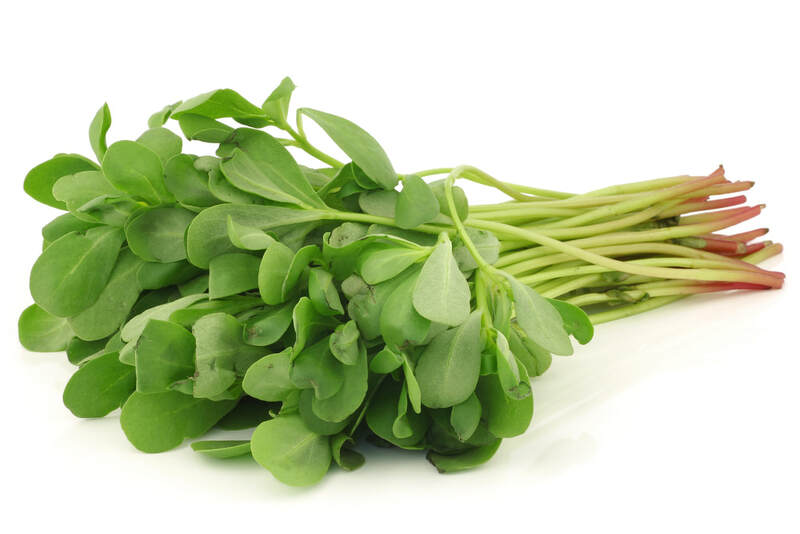 Purslane contains very low calorie but a nutrition superstar with high dietary fiber. This means that you can easily feel full and satisfied after consuming a meal of purslane. Improve Gastrointestinal Diseases. In Traditional Chinese Medicine (TCM), purslane was widely used for treating nearly everything, from hemorrhoids to diarrhea and intestinal bleeding. Even today, it is used for a wide range of digestive condition. The digestive health benefits of purslane are mainly attributed to its natural compounds, including dopamine, citric acid, alanine, glucose, malic acid and many others. Strong Bones and Teeth. The wide array of minerals found in purslane work together to promote stronger bones and teeth. The elements necessary for building strong bone tissue include calcium, manganese, iron and magnesium. In addition, these minerals help speed up the healing process of bone which can prevent development of osteoporosis. Improved Circulation. The copper and iron found in purslane help stimulate red blood cell production. When there’s sufficient level of these minerals in the body, there’s more oxygen being delivered to different parts of the body, which increases healing of organs and cells and improves metabolic efficiency. This herb is widely used in certain cuisines as a great addition to salads and many other recipes. Many describe the taste as a bit sour but mildly sweet. Since it is a succulent, the leaves are very crisp, which makes it a great add-on for salads. Purslane is often used in stews, salads, stir fry dishes, pickles, casserole and soups. It is also great in many alkaline foods and is mixed with dough to create delicious bread in different cultures. A word of caution: The only possible downside that experts have found in purslane is that it is relatively high in oxalic acid, which can lead to kidney stone formation. If you are suffering from kidney stones, it might be a good idea to avoid it. But, cooking or boiling it in water can eliminate a great deal of oxalic acid without losing the huge amount of healthy nutrients.